A friend of mine sent me a copy of The Face of Christ by Joe Castillo. I was enormously impressed. 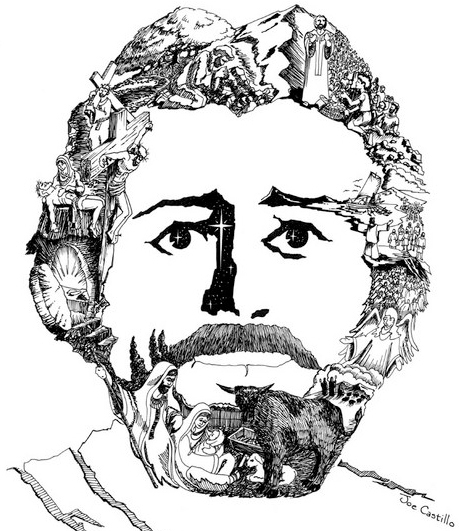 As you can see, the artist has incorporated major events from Christ’s life and ministry into the drawing, mostly in the beard and hair. The rolled away stone of the empty tomb corresponds nicely to where the ear would be, and the stars in the eyes provide a sense of scale for the Star of Bethlehem, which is tucked into the shadow of the nose. I think my favorite touch is using the Sea of Galilee and its mountain backdrop for the right eyebrow. Here’s a key to the events depicted, along with each corresponding Bible verse (which I verified separately). I found the information on this tribute site. Mr. Castillo is known principally as a sand artist. The term conjures up visions of large sculptures at a beach, but what Mr. Castillo does is very different: using his hands, he draws pictures in sand spread on a light table. The images are projected on a screen for the audience. Sound intriguing? You might want to check out some video clips of Joe Castillo creating sand story art. What do you think? Has Joe Castillo crafted something special? Does The Face of Christ speak to you on an artistic or spiritual level? Hope you’ll leave a comment. Please Throw Money– We’re Broke! ← What Kind Of Man Inserts Himself Into Old Print Ads?? It’s really clever and amazing how it was done. 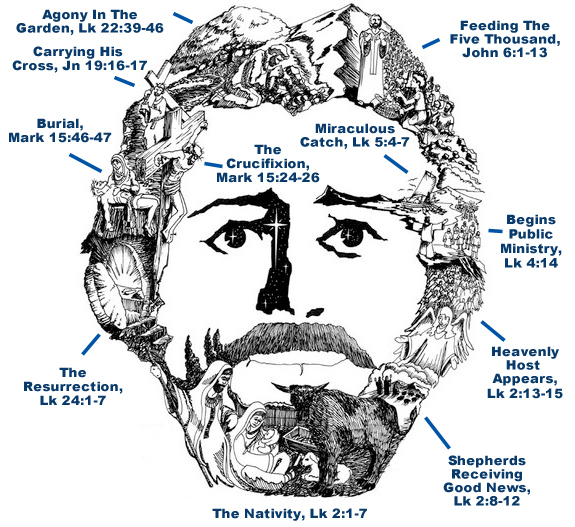 Depicting the story of Christ as illustrations which link together to make up the face reminds me a bit of how text illustration is produced, but in a whole new and better perspective. But when looking at the drawing, it really doesn’t look like it was done using a chunky marker pen (as seen in the video). The details are wonderful, I can see why you were so impressed with it. I have never heard of Joe Castillo but now I have seen his sand art I’m very impressed. I watched one video and enjoyed watching the process he uses very much. I appreciate Castillo’s art on an artistic level but it does nothing for me spirtiually as I’m not a Christian. Re your beliefs: you’re perfect just the way you are. It’s interesting, tho– your kind and altruistic nature is very Christ-like, if I may say so. Many thanks for stopping by. All I can say is WOW! That is incredibly utterly brilliant! Thanks for sharing this one, Mark! It certainly is. I’d love to know how Mr. Castillo mapped out each section en route to the finished design. A remarkable creation. Glad you enjoyed it, many thanks for stopping by! As amazing as Joe Castillo’s work is, I really think that by displaying Christ to America, he lost the competition, that is just the way our culture is today so Anti- Christ… Prayer out, Christmas or Nativity out… The term one nation under God is becoming politically wrong, tolerance in everything but excepting anything that has to do with Christ. You watch and see the unfolding– I hope I am wrong! It’s easy to become discouraged, and I understand your frustration: our modern secular culture never tires of preaching tolerance, but that doesn’t seem to extend to religion, especially Christianity, which is regularly mocked by the intelligensia. I’m not privy to Mr. Castillo’s thoughts, but I suspect he is sustained by Christ’s words: “If the world hates you, realize that it hated me first.” (Jn 15:18) As well as: “And behold, I am with you always, until the end of the age.” (Mt 28:20) Things haven’t changed much in the last 2000 years. Christ’s words should help sustain us, too. We must battle on and be of good cheer. A creative combination. The person who made this must be a genius. Glad you enjoyed the post, many thanks for stopping by! I was at a church sale and purchased the face of Christ by Joe Castillo but it is not the one that is shown here. It looks like, to me, that it might have been the initial first rendition of the face. It is not near as complex as the one shown on this page. At the lower right of the stone and continuing on to the entire bottom of the stone is imprinted: Seek the Lord and His Strength; Seek His Face Continually. Psalm 105:4. At the bottom of the stone is imprinted The Tennessee Mint and a marking I cannot distinguish. Can you tell me something about this work of art? There’s another page entitled About The Face Of Christ. It says the “true story” behind the drawing is a “personal drama of bitterness, despair and ultimately, forgiveness and restoration.” Joe wrote a book about it, and it seems that in order to learn the true story, one has to buy the book. However, you can see a snippet of the story here. Hope this helps. Many thanks for your interest and your comment. I have one that fell and broke, I did glue it back together, but I would like to replace it. How do I find one again. You may want to page thru the offerings to see what prints are available. Reblogged this on Me 🙂. I happened to be looking for something in my attic today and found my marbled stone copy of The Face of Christ. It is indeed a most magnificent piece, and as I shared the pic with my FB friends, I was immediately impacted by the workmanship that led to this masterpiece. God Bless Joe Castillo, and God bless you for bringing this back to light. It most certainly is an inspiring work of art, and a gift from the Lord to all whom seek His face continually. Hi, Miranda. Thanks so much for your kind comment and good wishes. I can recall being totally bowled over when I first saw Mr. Castillo’s Face Of Christ. The concept and execution are brilliant. A perfect stepping-off point for meditation on Christ’s life. I find myself wondering how Mr. C. hit on the idea, and thinking about all the time and effort that must have gone into figuring out how to blend the Gospel account visuals into the portrait. Truly amazing. Are your Bookmarks and Cards still available Mark?. I saw the Face of Christ framed many years ago and the image has always filled my soul. How can I purchase my own drawing so I can frame it? Hi, Colette. One used to be able to buy Face Of Christ prints from Mr. Castillo’s online store. I’ve just visited his site, however, and, sad to say, the online store appears to have been discontinued. I did some googling, but was unable to find anyone offering prints for sale online. There’s a note on Mr. Castillo’s site which says: “FOR BOOKINGS OR INFORMATION CONTACT: Tim Grable 615-283-0039 Tim@TheGrableGroup.com.” So you might try calling or emailing Tim to ask if prints are available. I’m not associated with Mr. Castillo, so I’m afraid that’s the best I can do. Best of luck to you! I am really inspired by the drawing of The Face of Christ. I would like to use that as a craft project for summer church camp. Is there a way to get a release so I can have the kids each have a copy to color for an art project?? Oh, I hope so. Hi, Pam. I’m not personally associated with Mr. Castillo, so I can’t give you approval to use his work. He does have a website, however, and if you click on the Info tab and scroll down, you’ll see: FOR BOOKINGS OR INFORMATION CONTACT: Tim Grable | 615-283-0039 | Tim@TheGrableGroup.com. Hope that’s helpful– good luck! I first saw this art on a Walk To Emmaus bulletin (a 3 night 4 day Christian weekend). Do you know if that may have been his original one? It would have been around early 2000 era. I’m cleaning out and came across the picture and will be showing it to my pastor. Was Joe from the DC, Virginia, Maryland area? Hi Geri, sorry for the late reply. I don’t know if Joe did any other versions of his Face Of Christ. He was born in Mexico City. He has a bio on his site, and you can read more about him here. He wrote a book about The Face Of Christ, if you’re interested. I don’t know what year he actually created it. Hope this helps. I’m not affiliated with Mr. Castillo or his business in any way. Cheers! I have one if your amazing pieces of art in the face of JESUS, The Tennessee Mint, and would like to purchase more for wedding gifts. Specifically, I have missionaries in India getting married in India and would love to send them one. Please and thank you! Hi, Susie. Mr. Castillo used to have an online store that sold Face Of Christ prints, but as far as I can tell, the store no longer exists. I did some googling, but was unable to find anyone offering prints for sale. There’s a note on Mr. Castillo’s site which says: “FOR BOOKINGS OR INFORMATION CONTACT: Tim Grable 615-283-0039 Tim@TheGrableGroup.com.” So you might try calling or emailing Tim to ask if prints are available. I’m not associated with Mr. Castillo, so I’m afraid that’s the best I can do. Good luck! A good number of years a ago, a colleague gave me me a print by Joe Costello, Refuge under His Hand, Psa 17:1-7. It has hung on the wall of my home ever since always with a current picture of our family right under it. I’m interested in obtaining a copy for each of my four grown children. Is the print still available? Hi, Keith. Mr. Castillo used to have an online store that sold Face Of Christ prints, but as far as I can tell, the store no longer exists. I did some googling, but was unable to find anyone offering prints for sale. There’s a note on Mr. Castillo’s site which says: “FOR BOOKINGS OR INFORMATION CONTACT: Tim Grable 615-283-0039 Tim@TheGrableGroup.com.” So you might try calling or emailing Tim to ask if prints are available. I’m sorry, I’m not affiliated with Mr. Castillo in any way. I would suggest doing an online search. Good luck, I hope you find what you’re looking for. I’m very glad you enjoyed it, Elaine– cheers! I have a mounted and framed copy of this from the TN mint. I received it in 1989. Love it. Excellent! Thanks for your comment, Cindy!